Amazing hostel, the entire property is beautiful and the receptionists are incredibly nice and helpful. Location is perfect if you're looking for something away from the touristy areas and actually within an actual Santorini community. Capital city is a quick 20ish minute walk away, and bus stop is also very close by. Very clean and secure. 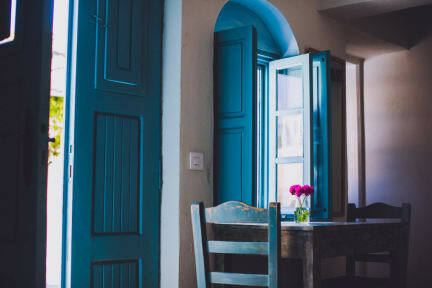 Perfect for those looking to experience Santorini beyond a luxury hotel! This has been my favourite hostel experience by far. Everything is clean, I love the blankets they give you, the facilities are amazing, the staff is friendly, and they have daily events for you to get acquainted with your hostelmates! The free breakfast is delicious, the location is about 20 minutes from the main town, and they have two adorable dogs that guard the property. I loved just hanging out there, so spacious and beautiful!! 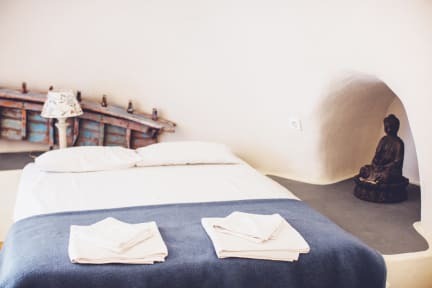 if you want a quiet and relaxing stay in Santorini, this place is ideal for you though it's far from the bus stop (15 mins) and Fira (30 mins). But since I love to hike, I don't mind the distances. If you'll take the bus to/from Caveland lugging your big suitcases, you'll need to negotiate a hilly road but if you take airport transfers (a bit expensive at Euro20; bus fare is only Euro1.8), then this shouldn't be a problem. Cool staff. Shout out to Rochelle Eusebio! Thanks for the chat over wine!